Verne's works in English (and other languages, for that matter) often have varied titles. Try here (http://www.phys.uu.nl/~gdevries/langu...) to identify title variations. Many English translations are abridged in order to "improve" the story line. From speculative fiction, deep space adventures, and alternate histories to epic fantasy realms, all who can admit their dorkdom are welcome. Join Joel and Tommy the third Monday of every month at 7PM. This month we will be discussing Journey to the Center of the Earth by Jules Verne. 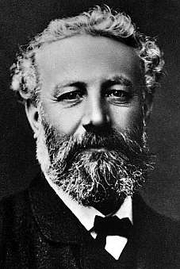 Jules Verne was born at Nantes on the 8th of February 1828. After completing his studies at the Nantes lycée, he went to Paris to study for the bar. His first success as a writer was obtained with Cinq semaines en ballon. He was a member of the Legion of Honour. He died at Amiens on the 24th of March 1905. His posthumous works were edited by his son, Michel. Verne's works in English (and other languages, for that matter) often have varied titles. Try here (http://www.phys.uu.nl/~gdevries/langu...) to identify title variations. Many English translations are abridged in order to "improve" the story line. Jules Verne is currently considered a "single author." If one or more works are by a distinct, homonymous authors, go ahead and split the author. Jules Verne is composed of 38 names. You can examine and separate out names.